Winemaker’s Notes: Ruby color with purple hues of good intensity. Complex aromas of ripe fruits such as cherries, black cherries, and plums as well as vanilla, leather, tobacco, and spices such as black pepper and paprika. Full-bodied, sweet tannins, rich red wine with good balance and complexity and a long finish. Pairs well with grilled red meat and pastas. My Review: If you’ll recall, a few weeks ago I was lucky enough to attend a lunch featuring several Santa Julia wines. During that lunch, the third course was a steak paired with a reserve cabernet sauvignon and a reserve malbec. While I enjoyed them, and the steak, the chimichurri topping on the steak had quite a bit of heat to it, and sorta fried my palate a little, making it hard to be sure I’d gotten a good sense of the wines. Fortunately, I was able to get a sample of the wines sent over so I could check them out again without my mouth being on fire (though that steak was still delicious). This past weekend my wife and I decided to do a surf and turf dinner (gorgeous weather makes me want to grill), and since it’d had originally been paired with a steak, it seemed appropriate to that I should do so again. After cooking up a couple of NY Strips and a lobster tail, we sat down with our dinner and bottle of wine. In the glass the wine was a dark red color with slashes of purple. On the nose I didn’t get a specific aroma so much as a generic red fruit smell that I typically associate with cherry. In the mouth the cherry flavors came through much more, especially with a tartness on the end that wasn’t tannic. In fact the finish was very light on the tannins, which was nice considering the lobster tails on the plate. 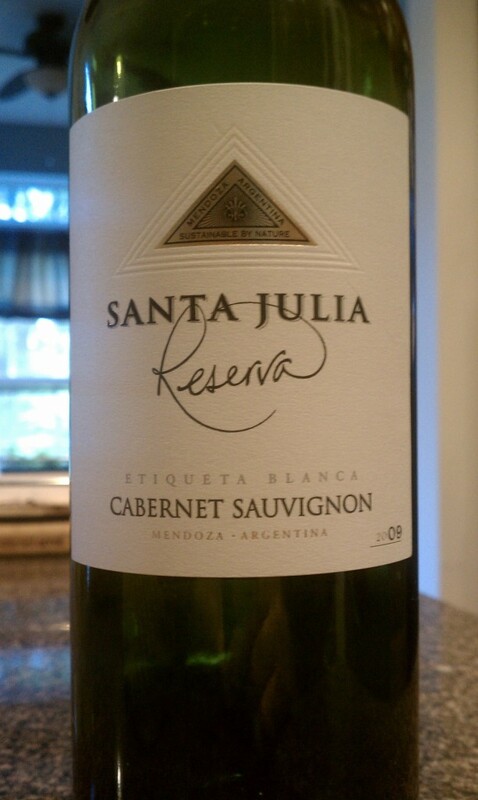 This wine was another example of why I wines from South America continue to find their way into my house. Argentina, Chile, and really everything I’ve had from the continent in general, are putting out good, quality wines at prices that make it very enticing to try new things since they’re priced to move. If you want to give the 2009 Santa Julia Reserva Cabernet Sauvignon a try, and I recommend you do, and you can’t find it in your local store (I haven’t seen it at mine yet either), you can follow this link and have some shipped to you directly.